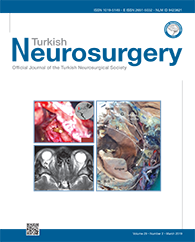 1Health Sciences University, Bagcilar Training and Research Hospital, Neurosurgery Clinic, Istanbul, Turkey DOI : 10.5137/1019-5149.JTN.20240-17.1 AIM: To evaluate the results of patients who underwent axial, subaxial and upper thoracic laminar screw fixation for posterior stabilization. MATERIAL and METHODS: The patients who underwent laminar screws at the cervical and upper thoracic levels in our clinic in a 5-year period were evaluated retrospectively. RESULTS: A total of 54 laminar screws were used in 25 patients, aged between 6 and 82 years. The most frequent diagnoses were cervical spinal stenosis and craniovertebral junction anomalies. There were handicaps to perform other type of screws in 19 out of 25 screws during the first 4 years, and 9 out of 29 in the last year (p=0.0009). Two modifications were performed in some cases. In 4 segments with thin lamina, a shorter screw was used to leave clear the thinnest part, and in 3 C2 levels with almost full-length bifid spinous process, shorter screws were inserted from the medial sides of the bifid processes with a more vertical orientation. There was ventral cortex penetration in 11 screws without new neurological deficits. One of them was removed because of its full thickness insertion into the spinal canal. The fusion rate was 75% in 16 patients who were radiologically followed for longer than 6 months. In one patient out of 4 without fusion, the unilateral screw was loosened, and in others the laminar screws were not loosened.